A young student at Private Picassos, one of many places that offer art classes for kids in Park Slope, Gowanus and beyond. PARK SLOPE — School's out, and reading, writing and math are history. Let your kids (and babies and toddlers) explore their creative sides at these neighborhood classes, both this summer and all year round. Here's a look at some recently opened spots for art classes and tried-and-true local favorites. Did we miss one your kids like? Let us know. This tiny studio hosts cozy workshops on painting, collage, sculpture and more, including a class that guides students in creating a portfolio of art based on Brooklyn landmarks. Artist and dad Miguel Ayuso leads these Saturday morning art-making sessions at the nonprofit Trestle Gallery & Brooklyn Art Space. They’re designed for parents to participate alongside their child. Activities include drawing, toy-making, puppet-making and storytelling. Price: $22 to $47 per class, depending on age group. Classes are 45 to 90 minutes. Toddlers can learn mosaics, batik and printmaking and older kids can take an after-school arts immersion program at this studio run by designer Karen Merbaum. Barking Cat also hosts art parties at its studio, at your house, and even inside Prospect Park, where party guests can create pinwheels or wind chimes. Toddlers can learn to paint with bubble wrap and make hanging sculptures while fifth graders tackle drawing characters such as monsters, heroes and "everyday people," at Brooklyn Design Lab. Instruction has a design focus and kids learn topics such as Lego architecture. Artist and designer Neil Powell runs his own art studio and gallery space and also teaches workshops for small groups of kids. The program includes papier-mache sculpture, book making, found object sculpture and mixed media collage. 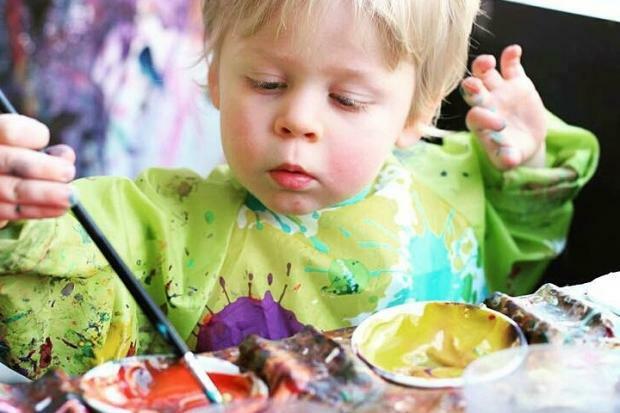 Giocare, Italian for "play," lets toddlers get messy with paint and glue at 90-minute drop-in art sessions twice a week. The sessions are at Giocare's newer "Play Spot" location across the street from Slope Playground, where you can go for some outdoor time afterward. Better known as a "paint and sip" venue where adults can enjoy a glass of beer or wine while an artist guides them through painting a picture, Pinot's Palette also has alcohol-free painting classes for kids (and of course birthday parties). Times vary, check the store's calendar for sessions. The ones labeled "Little Brushes" are for kids. Private Picassos offers a range of weekly classes for babies and up, as well as a full-day (9 a.m to 3 p.m.) summer camp. Kids can also do drop-in art projects such as wire sculptures and faux stained glass. Private Picassos will also come to your home and give private, individual lessons for a single child ($95/hour) or for small groups. Learn the Japanese art of intricate paper folding at this neighborhood institution, which holds regular classes and hosts birthday parties. There's also a drop-in corner where kids 3 and up can test drive origami any time they want using books or tablet software to guide them. Price: Summer camp ranges from $425 - $500 per week; after-school program for 11-14-year-olds is $450 for eight weeks. Scholarships are available. Learn weaving, sewing and other cloth-based art forms at the Textile Arts Center. There are summer camps, mini camps, after-school programs for teens, and one-time parent-child workshops where you and your little one can learn skills such as how to make a denim rag rug. This clay studio, founded in 1974, offers ceramics instruction for kids 6 and up by artist Adrienne Yurick. There aren't classes this summer, but Yurick will be teaching in the fall. Ume Ume offers multi-week enrichment classes for babies and toddlers, as well as one-time drop-in classes a few times a week. In the "It's Art Time" class, future Rembrandts "study the works of well-known artists to encourage the exploration of materials, techniques, and styles." Brooklyn artist Zipi Green starts her classes with a story about a specific artist and their methods as a jumping off point for students’ explorations in painting, sculpture and other mediums. Some classes are taught in Green's native Hebrew and each semester ends with an exhibit. There are no classes over the summer, but Green teaches in the fall, winter and spring. For suggestions on drop-in art classes for toddlers, check this Mommy Poppins round-up. The websites SkipKid and Little Little list drop-in classes for kids by neighborhood.